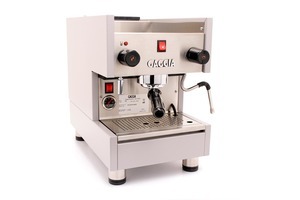 The Gaggia TS is a high-end semi-commercial espresso machine with professional-grade construction, components, and capabilities. This model offers all the features associated with commercial machines while retaining a relatively small footprint, making it ideal for home or light commercial use. The Gaggia TS has an electrically heated brew group with a dedicated thermostat to monitor and maintain proper brewing temperatures for optimal espresso extraction. Aided by a chrome-plated brass brew group and portafilter, as well as a 2.3-liter horizontally mounted copper boiler, this semi-commercial machine is fully equipped to deliver ideal brewing conditions. Steaming and brewing functions can be performed simultaneously for your convenience. Those who enjoy milk-based beverages are sure to appreciate the Gaggia TS’s commercial-grade stainless steel steam wand, which can deliver rich micro-foam and froth for cafe-quality drinks. The TS has a steam wand on the right hand side and a hot water dispenser on the left, keeping both functions separate.